Finally! I have been waiting forever to read this book, so when I saw our school librarian unpacking it from a box, I borrowed it before she even had time to label it! Raina Telgemeier is the hero of all my female students, and Victoria Jamieson's debut graphic novel will appeal to them just as much, if not more. 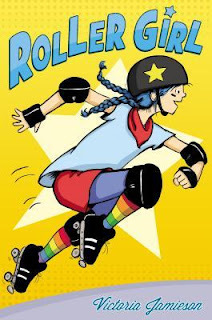 I loved that this book focused on a sport (roller derby) rather than family or friend issues. Sure, there is plenty of drama, but readers also learn a lot about how roller derby works. The illustrations and bright colors will appeal to readers. I am eager to see if the male graphic novel fans in my class check it out. I think some brave souls will, and then will realize how much there is for everyone to love in Roller Girl. Our school library has this copy, but I definitely need a copy for my classroom, as well. This book is wonderful.